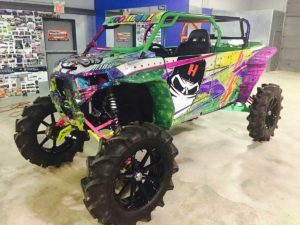 Check out this extremely custom MONSTER Polaris RZR…Nothing stock here folks! 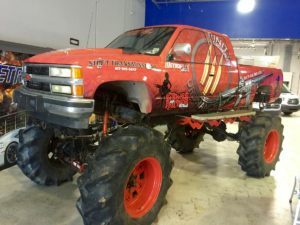 This bike was built by David Eggars, Starr Offroad and Triple Threat Offroad. Thanks guys, we enjoyed working on it! 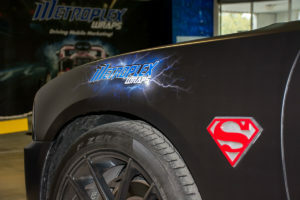 Call Metroplex Wraps for your next Custom Wrap today at 817.997.4431 or Come See us! We are centrally located at 2161 E. Loop 820 N. in Fort Worth, Texas 76118 next door to Texas Master Craft Boats! Posted in Uncategorized on February 16, 2017 at 9:37 pm by Metroplex Wraps. 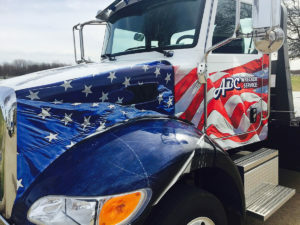 We just delivered multiple truck wraps for ABC Wrecker all dressed up in the American flag! 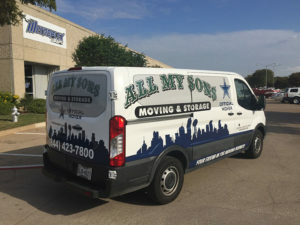 Call Metroplex Wraps for your next Commercial Wrap today at 817.997.4431 or Come See us! We are centrally located at 2161 E. Loop 820 N. in Fort Worth, Texas 76118 next door to Texas Master Craft Boats! 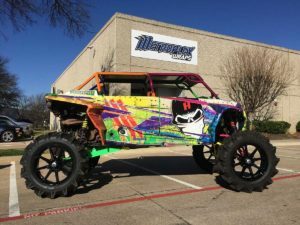 Posted in Uncategorized on February 10, 2017 at 4:37 pm by Metroplex Wraps. Thanks Dan! We enjoyed working on it! 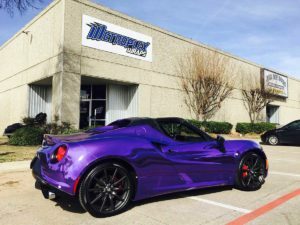 Posted in Uncategorized on February 10, 2017 at 4:27 pm by Metroplex Wraps. We found Superman! There is a real life Super Hero right here in Fort Worth…and his name is Damon Cole. 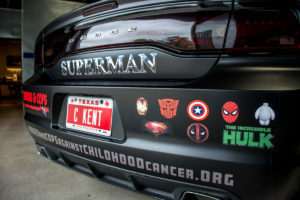 Damon is a Fort Worth Police Officer on a mission to fight childhood cancer. We have been fortunate over the years to work on some of the most impressive projects. This project is leaps and bounds in front of them all! It is our honor and privilege to be selected for this mission: Here is Damon’s story in his own words. My name is Damon Cole; I am a full time Police Officer in Fort Worth, Texas. I have been a police officer since 1999. As a police officer I have dealt with so many children over my career. Keep in mind when I am dealing with them as a police officer, it is not always in a good light. So I wanted to try and make a big impact on the children that I come in contact with at work. Every child should know that a police officer is always there to help them through anything. The best way to get that message across is to build up a trusting relationship with them. So around 13 years ago I had the Superman logo sewed on my bulletproof vest that way whenever I would deal with a child on a call for service, I would tell them a secret but they would have to promise me that you will not tell anybody. I then make them pinky promise me to keep the secret. I would then undo my shirt so it exposes my Superman logo on my bulletproof vest. At this point the children go crazy, and they usually ask me where my cape is. I tell them that I cannot wear it with my uniform because it will get wrinkled. From that moment on the child will always remember me and that will make it easier for me to help them in the long run because they trust me. 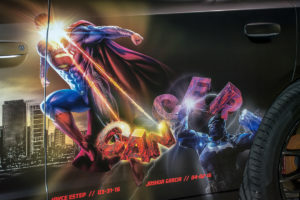 In 2012 while working for Dallas Police Department I started dressing up as Superman doing different community events and going to local hospitals. In April of 2015 I learned of a 7-year-old boy named Bryce Schottel who had cancer. 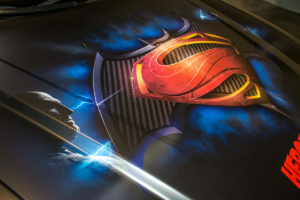 Bryce lives in Smithton, Illinois, and he is a very big Superman fan. As soon as I learned all this, I just knew I had to make the trip up there to see him. I used three vacation days from work and I hopped in my Superman Charger and I made the 11 hour drive to see him. I went to his elementary school first as Iron Man and I took pictures with all the children and the staff at the school. I then went to Bryce’s house dressed as Superman where I met with him and his dad. Bryce was smiling ear to ear. I showed him my Superman car and I gave him some Superman stuff. I then gave him one of my extra Superman capes and he loved it. He immediately put it on and he didn’t want to take it off. I spent several hours with Bryce and I even dressed up as Iron Man for him. We then played video games for a little bit and I wish I could say I let him win but he really did beat me so many times. I left his house and went to a fundraiser that the local police department was putting on for Bryce and his family. I dressed up as Iron Man and I had my Superman Charger on display. I spent several hours there until I left to head back to Fort Worth, Texas. It was such a great experience to see how happy I had made him and his family and that is when I knew that I had found my calling. Ever since then, I will go anywhere to see any child so I can have the same impact on them as I did with Bryce and his family. I am very picky about all my costumes and I will a costume if it really looks like the real superhero because I want to have a lasting impression on every child I meet. If you have a child that has cancer or any illness and you want to go see them, all you have to do is send me an email to supermandamoncole@gmail.com. Yes I will go see adults and teenagers also. I will go see anybody that wants to see me. Posted in Uncategorized on November 8, 2016 at 8:32 pm by Metroplex Wraps. 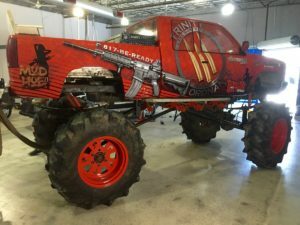 Truck Wrap – Monster Truck Mud Hoe II Ready to get it on! 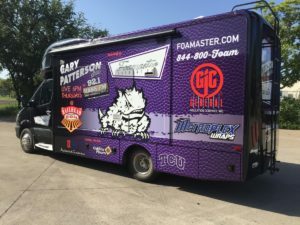 Here is the YouTube video showing the completed wrap for this awesome truck! 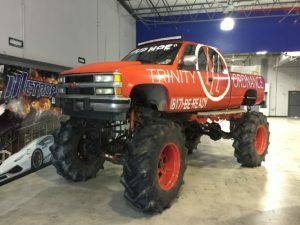 As promised, this monster truck wrap was just completed for Mike Walsh. 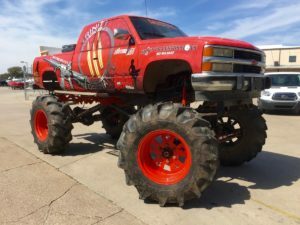 Mike is with Rednecks for Paychecks and this is his new Mud Hoe II monster truck. 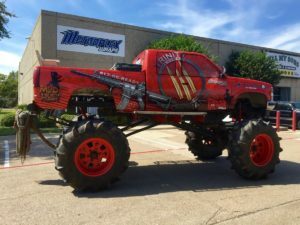 Mike chose Metroplex Wraps to create a total makeover for his monster truck wrap and our team delivered! 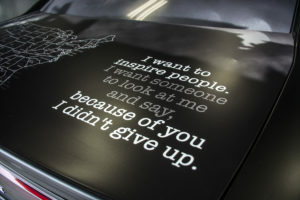 We incorporated all of the elements that were important to Mike and our design department brought his vision to life! 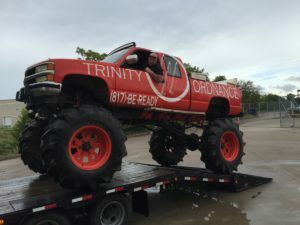 Mike’s main sponsor is Trinity Ordinance and these boys mean business! The Fort Worth Trinity Ordinance gun store offers a wide range of firearms. Anything from small concealed carry pistols to the most powerful rifles. Our gun sales include trusted brands of guns such as Glock, Smith and Wesson, Taurus, Sturm Ruger, Springfield Armory, Remington, Mossberg, Diamondback, and many others. We’re honored to have been voted one of the best gun dealers in the DFW Metroplex for our selection. 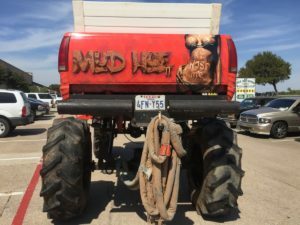 If you want to see this new truck wrap and this truck in action don’t miss the Fall Mudcrawl that runs from September 29th thru October 2nd in Saint Jo, Texas celebrating 5 years of mud, rocks, music and fun! There will be live music by popular local, regional, and national acts. 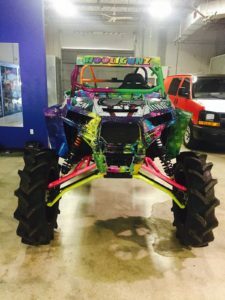 You can pull your ATV’s and UTV’s right up to the concert area and have a Redneck Tail Gate Party with first class live entertainment! It doesn’t get any better than that! Watch the concert Redneck style! If you love mud, you’re gonna love RWP! Come race with the pros, or get in on the action in one of our seven mud pits. Everyone loves the action and excitement that comes with the mud pits! 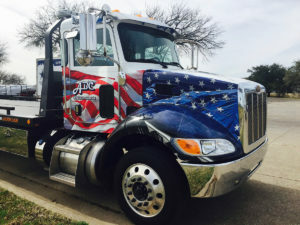 Call Metroplex Wraps for your next Truck Wrap today at 817.997.4431 or Come See us! We are centrally located at 2161 E. Loop 820 N. in Fort Worth, Texas 76118 next door to Texas Master Craft Boats! 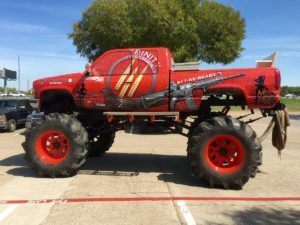 Posted in Uncategorized on September 27, 2016 at 3:03 pm by Metroplex Wraps. 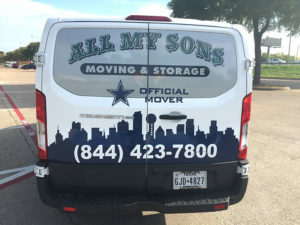 Fleet Wraps for All My Sons Moving and Storage Underway! 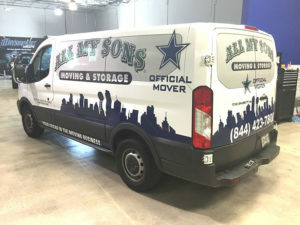 Call Metroplex Wraps for your Fleet Wraps project today at 817.997.4431 or Come See us! We are centrally located at 2161 E. Loop 820 N. in Fort Worth, Texas 76118 next door to Texas Master Craft Boats! Posted in Uncategorized on September 14, 2016 at 6:50 pm by Metroplex Wraps. 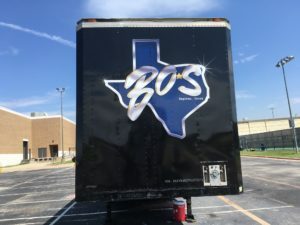 This is one tall truck wrap. Probably going to need our tallest installers! This bad boy is about to under go a big transition! 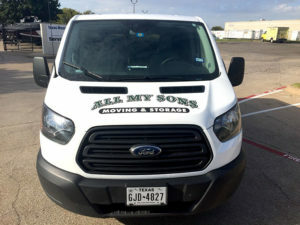 Here are the before photos so stay tuned for the finished truck wrap! Posted in Uncategorized on September 13, 2016 at 6:41 pm by Metroplex Wraps. 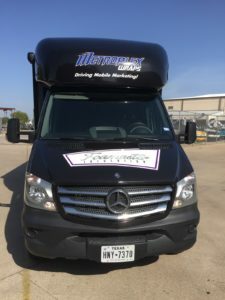 Call Metroplex Wraps for your next RV wrap today at 817.997.4431 or Come See us! We are centrally located at 2161 E. Loop 820 N. in Fort Worth, Texas 76118 next door to Texas Master Craft Boats! 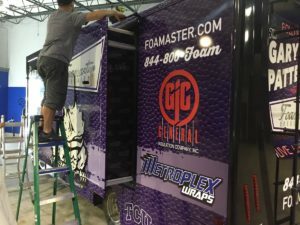 Posted in Uncategorized on September 13, 2016 at 6:38 pm by Metroplex Wraps. 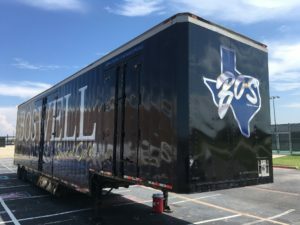 We want to thank Michelle Lemons and Kevin Fallon for working very closely with us on their new band trailer wrap. Kevin played a big part in the design process working along side our design department. 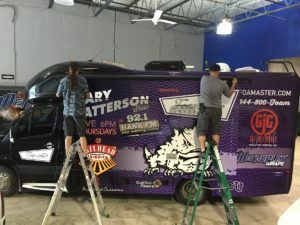 The new wrap looks great and we enjoyed working on it. 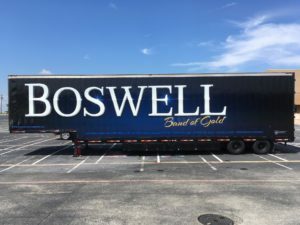 Their trailer was in need of a new design and wrap that would impress visually equal to the Boswell Band of Gold musically. 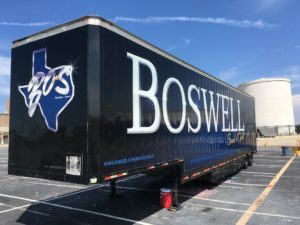 The Boswell Band of Gold can now shine in both areas! Enjoy! GO PIONEERS! 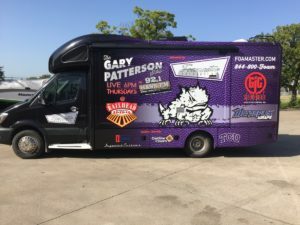 Call Metroplex Wraps for your next Trailer wrap today at 817.997.4431 or Come See us! We are centrally located at 2161 E. Loop 820 N. in Fort Worth, Texas 76118 next door to Texas Master Craft Boats! Posted in Uncategorized on September 13, 2016 at 6:43 pm by Metroplex Wraps. 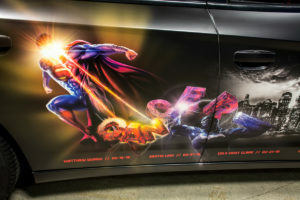 A vinyl car wrap doesn’t have to be flashy to achieve your desired result. 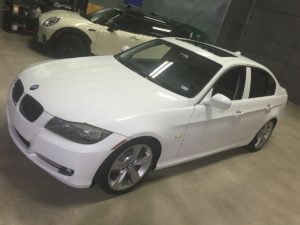 This BMW is a perfect example of just that! 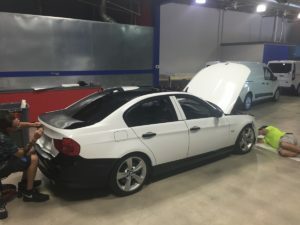 Our client, Jeffrey Rowe, came to us to help him change the color of his gloss black BMW 335i. 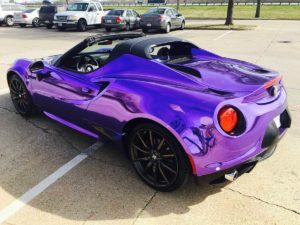 He loves his car but just didn’t love the color. 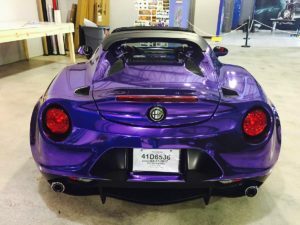 He knew he did not want to get it painted because of the length of time that process takes. 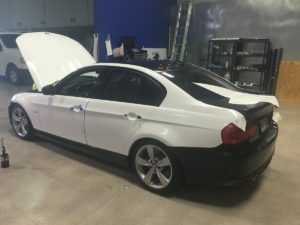 He needed a faster solution that would get him back on the road as soon as possible. 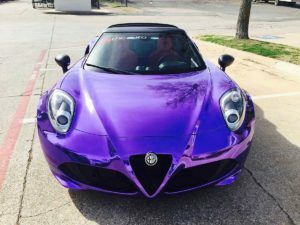 We suggested a color change in the form of a vinyl car wrap. He came by our shop and looked at the sample swatches of white that we offer. 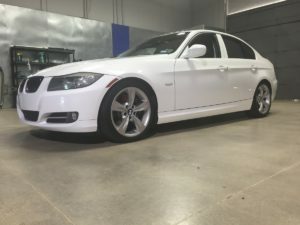 Our custom options for gloss white material can actually be brighter than almost all stock factory white paint. 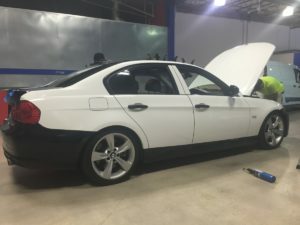 A color change vinyl car wrap is the most difficult type of wrap installation requiring a master installers knowledge and experience to execute properly. 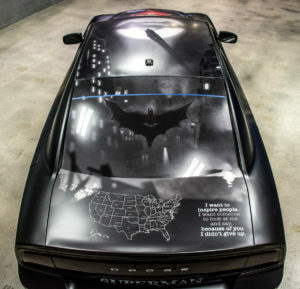 Not all wrap shops can execute this type of installation at the highest level. 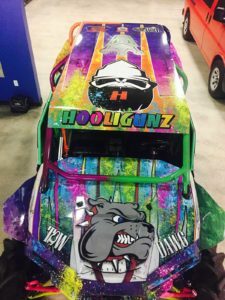 If you are considering this type of vinyl car wrap you should select a wrap shop that can show you examples of their completed work as a reference. 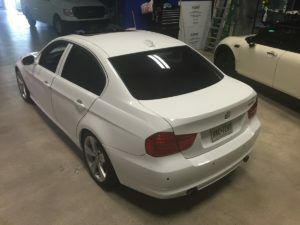 For this application we used Avery Gloss White to cover the body and the window trim leaving the chrome accents unwrapped. 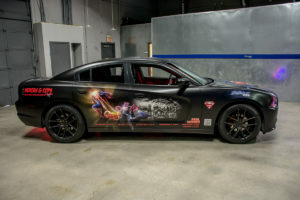 The optimal result, as shown here, is to make the vinyl car wrap appear as if it is the original color of the car. Unless Jeffrey let’s the cat out of the bag no one will know his car is really black. 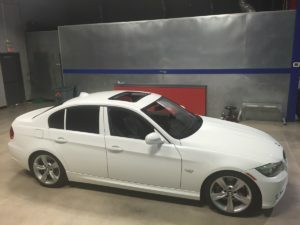 Everyone will assume that the gloss white vinyl car wrap is paint when viewing the car. 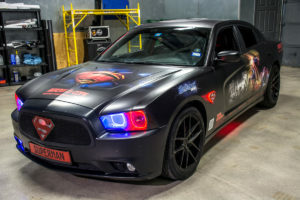 Call Metroplex Wraps for your next vinyl car wrap today at 817.997.4431 or Come See us! We are centrally located at 2161 E. Loop 820 N. in Fort Worth, Texas 76118 next door to Texas Master Craft Boats! Posted in Uncategorized on August 8, 2016 at 6:44 pm by Metroplex Wraps.